The Hough Level is a connecting tunnel which runs from Dickens Wood in the east to the treatment work site in the west. The full length is about 1570 yards and access is possible at several points except at the extreme western end. 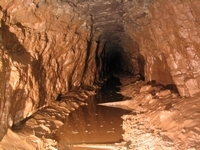 The passage was used for drainage and ore removal from the mines. The first part of the tunnel that was dug was the section from Dickens Wood to Engine Vein and it is probable that this was mined in the 1760s by Charles Roe?s company to provide drainage from Engine Vein. The hand-picked tunnel can be followed from the Edge to Engine Vein but does not appear to continue any further. There is a shaft shortly after the start of the tunnel which would have helped with ventilation. After that, the next connection with the surface was at Square Shaft, about 280 yards (260m) from the entrance and then Blue Shaft at 520 yards (480m). The original level had a short dead end branch at Square Shaft. The whole passage was mined as a coffin level with pickmarks clearly visible on the walls. Evidence from a tunnel in Brynlow shows that explosives were available but the soft sandstone that most of the Hough Level goes through could probably be worked by pick alone. The section from Engine Vein to the Edge would have been just as important to drainage in the mining period from 1857 onwards and it was enlarged throughout with the creation of a large waste heap outside the entrance in Dickens Wood. The enlargement included taking out some of the bends so that a railway could be laid along the full length. We do not know whether the extension was contemporary with the widening but the widened section between Engine Vein and Square Shaft would be of limited use until the Hough level extended the whole way to the treatment works. We know in 1865 that the Hough Level, known then as Oakes? Level, was being driven from the works. This would be after the heyday of working in West Mine when the Alderley Edge Mining Company was looking to obtain ore from Wood Mine, Brynlow and Engine Vein. The depth of the Hough Level appears to have been set by the depth of Engine Vein and the tunnel from there to the exit near the treatment works was designed to slope downhill gently to assist moving full tubs. This would have required accurate surveying over the surface between the various mine entrances. The extension was driven in two sections, firstly from the west to Brynlow (about 570 yards - 500m) reaching the Brynlow mine some 10 yards below the original adit entrance, draining the mine and exposing a fair body of copper ore. It also provided a route to remove the ore direct to the works. From Brynlow to Engine Vein, 480 yards (440m), it is probable that two headings were driven at the same time as they meet roughly half way between the two mines. The surveying was not too good and the error of about two feet vertically and six feet horizontally can clearly be seen. The full length of the Hough Level (excluding branches) is about 1570 yards (1430m). Ore tipped down the various chutes could be filled into trucks on a railway running from Square Shaft right through to the works. Trucks were pushed by hand down the gentle slope to the western end of the passage where they were fixed to a rope or chain to be pulled up a short incline to the surface using steam engine power. A full trip through the Hough Level involves waist deep water, mud, and a long walk. For this reason, visitors are normally limited to walking up the level from Dickens Wood to Engine Vein. All access points are securely locked and permission to visit the Hough Level must be sought from the Derbyshire Caving Club (see the webpage on visiting the mines). Starting from Dickens Wood, the passage runs a short distance along the Stormy Point fault where some copper was probably recovered in the 19th century. After a short while, the passage reduces in size and the now-blocked air shaft near the entrance is passed on the left in a small recess. The passage twists around for some time before reaching Square Shaft. Here, a section of the original passage can be seen that was not enlarged in the 19th century. Square Shaft (actually rectangular in section) was dug in the 18th century and is the deepest shaft on the Edge at about 180 feet (55m) deep. At the bottom, there are some old rails (long wrought iron bars that were nailed down onto wooden rails) and the signs of the 19th century ore chute. The passage to Engine Vein is straighter and eventually passes the ladderway up Blue Shaft and then under the reconstructed ore chute at Bear Pit. Climbing the ladders in Blue Shaft take the visitor back into Engine Vein. A branch to the east (left) after Bear Pit goes as far as Ring Shaft ore chute. The normal route is straight ahead can be followed until the 1930s boat is met at the widening where the Brynlow and Engine Vein headings met. Beyond the boat, the passage drops a little and water is usually seen. When the mine was working, the water was drained away but is now held back by infilled shafts at Brynlow and the original west entrance. Just before Brynlow, the water is usually deep enough to require swimming or use of a boat. The passage now turns west as it passes the bottom of Brynlow Mine before another ore chute is passed and water is regained fro the section to Field Shaft. A branch on the right (north) leads to yet another ore chute located at the east end of the Field or Brynlow Opencast. Field Shaft also served the Opencast and was a blockage on the route for many years. After Field Shaft, the passage is straight until a junction is met and the main passage turns right. Left leads to another blocked shaft and straight on leads to a low backfilled passage under the sandhills area. 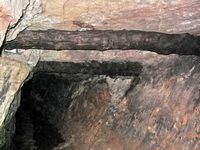 Continuing along the northward heading passage, a branch is met from Wood Mine before the main passage closes down because of another infilled shaft. This shaft has not been dug out as it lies on the edge of the National trust property and the Scheduled Ancient Monument covering the treatment works. Turning right at the junction (east again) leads into the connections to the Probationers' Series (another way to get ore from the Opencast) and Wood Mine. This formed the main route out of Wood Mine for ore in the 1860s. The whole length of the Hough Level is leased by the DCC. Access to the section from Dickens Wood to Engine Vein is fairly easy and visitors are taken along this section to see the 18th and 19th century workings. The route up Blue Shaft is not used except by more experienced and fitter visitors. 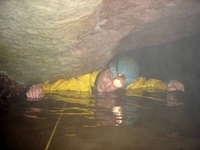 Beyond the boat is wet and is normally restricted to cavers and miners with the appropriate clothing and capability. The same applies to the section from Brynlow to Wood Mine although visitors to Wood Mine may occasionally be able to see the start of the Hough Level from that end. DO NOT ATTEMPT to get into the Hough Level without help from the DCC. For more about visiting the mines, click HERE. Go to the main photo gallery for more pictures of Hough Level.